When I told friends and relatives about Dinesh's kayak trip around the Salton Sea, I usually received two responses. First, they asked questions in regards to the sea, as most of them knew nothing about it. Second, they wondered what in the world I was going to do while he was kayaking. I figured that the sea was in the desert. I like the desert. I would see many birds. I like birds. Plus, I didn't know a heck of a lot more about the Sea. This trip would be a learning experience for me. Dinesh also needed the vehicle support if he was to take on this challenge. What a fascinating place, the Salton Sea. I now know it on a first sea basis. Go for the great kayaking, the birding, or the fishing. As you walk along its shore, a crunch, crunch will emanate from under your shoes. 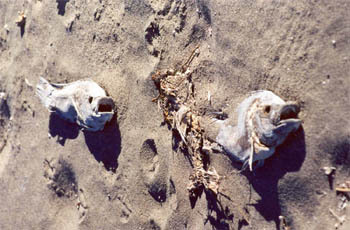 The skeletons of the thousands of fish that have died. Dead barnacles add their discarded bodies also. Bleached white by the desert sun, it is a great lesson in fish anatomy. I kept thinking that enterprising jewelry designers could have put all the skeletal parts to good use. Occasionally, in out of the way places, I went to many of these in order to help Dinesh put his kayak in and out, there would be pockets of whole dead fish floating in standing water, their mouths open in one last gasp of air. These had a terrible stench about them. But, mostly there was just a salty sea smell. The Salton Sea contains four species of sport fish: Orange Mouth Corvina, Sargo, Gulf Croaker, and Tilapia. The corvina, sargo, and croaker are from the Gulf of California. The tilapia come from East Africa. They like warm water and can't survive in water temperatures less than 55°F (13°C). In the winter, the water temperature of the sea can sometimes dip below 55°F for several days at a time. When this happens, many thousands of tilapia will die. Hence, the skeletons on the shore. Many fish also die from the green tides or algae blooms. These tides come about when a group of microscopic plants called algae suddenly receive too many nutrients. The runoff from agricultural fields adds phosphates into the sea. This causes the algae to grow rapidly or to "bloom". This turns the water a green color. The algae not only grow quickly, they also die rapidly. This dying process pulls oxygen from the water. This usually happens in the summer when the sea is at its warmest and there is little oxygen to begin with. But estimates of the tilapia population in the sea put them at up to 100 million. That's a lot of fish. How do I know about all of this? I must confess that I have right here in front of me a copy of Steve Horvitz's Salton Sea 101. This is an excellent, easy to read guide to the sea. I also learned plenty from the Visitor Center at Park Headquarters. I usually spent a good part of the day alone. I would drive Dinesh to the put-in spot. We would unload the kayak, he would get dressed for the day and I would push him off. Most of these spots were at the ends of dirt roads. For company I would have the birds. Avenue 81 (map point 4) was a good example. It ended at the sea and had a canal along one side. The canal was filled with terns, gulls, egrets, and herons catching fish. In the sea, there were more terns as well as grebes, stilts, ruddy ducks, coots, cormorants and my favorite, pelicans. Since Dinesh was usually underway by 8 A.M., it was a perfect time to commune with the birds. 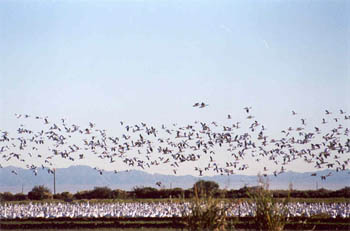 The Salton Sea is an important stop on the Pacific Flyway. In years past, birds used to have many more options as to where they could rest and feed on their long migration from the north to the south. Urban sprawl and development has eliminated a good number of these sites. 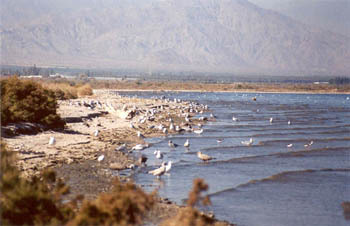 Without the Salton Sea stop, the birds would have nowhere to go. So come see them. I recommend the Sonny Bono Wildlife Refuge. This area is good for birders or for anyone who would just like a pleasant place to go for a walk. Unit 2 of the refuge (take Vendel Road off Hwy 86) has an observation deck, duck blinds and a trail that skirts several ponds. 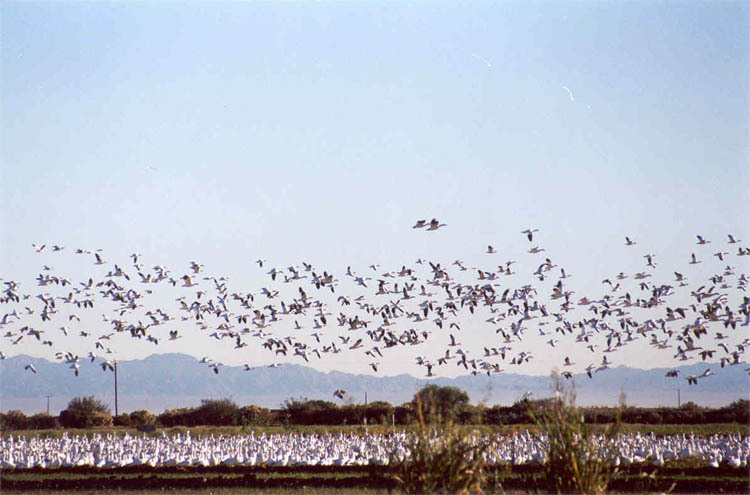 On the way into the refuge, I saw thousands of snow geese in the fields. The Rock Hill area (take Sinclair Road from Hwy 111) offers a Visitor Center and a wonderful one mile hike out to Rock Hill. What a view from the hill and informative displays along the trail. 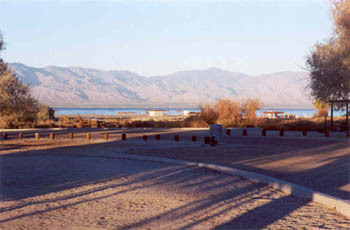 In Salton City, the Bird Sanctuary-Nature Trail-Cacti Garden is another good place to see wildlife. Over 400 plants and trees were planted by Ray Jennings with the help of volunteers. The trail is right next to the sea and a peaceful spot to visit. In early November, the most noticeable aspect of the sea was the lack of people. On the sea itself I saw only 2 other boats. Dinesh's red kayak wasn't hard to spot, as he was the only person on the water. The water being a mahogany brown color, you really couldn't see into it. At Park Headquarters, mostly vacant campsites waited to be occupied. Nice sites too. Showers were close by. Besides the aforementioned Visitor Center, there was a boat launch and wash. Fishermen and women set up their poles along the rock wall water front. I never saw anyone reel anything in. Fall and winter are not the best times to fish the sea. In the summer, however, the fishing is phenomenal. You can fish for a day and haul home over 100 tilapia. There is no limit to the number or size of fish you may catch. Someone needs to reduce that 100 million tilapia population. We ate dinner early when we camped and would walk down to the sea after we had cleaned up. The mountains glowed a pinky-orange from the setting sun. A full moon came up and the white pelicans sailed away on the water like a glowing, ghostly armada. This lovely setting was offset by the trains that roared by nightly. We were surprised at how fast we became used to the noise. Although looking out at the vastness of the sea and the empty mountains behind it could take you away from it all, when you turned the other way, the highway and railroad tracks let you know that the wilderness experience was out on the water in a kayak. One last observation. Salt. It was everywhere. Our car, the kayak, Dinesh's clothes, our sunglasses. I would think someone could harvest and sell Gourmet Salton Sea Salt. The proceeds could go to help save this vast wildlife area. I was never bored. The birds, the water and openness had a calming effect. The people I met were eager to talk about the sea. They were as friendly and open as their environment.